Can Your Pool Cover Handle the Weight of a Blizzard?Can Your Pool Cover Handle the Weight of a Blizzard? If your pool cover is up against massive amounts of heavy snowfall, make sure you know how to remove snow when the time comes. to prevent irreversible damage! Nothing gets people quite as riled up as the potential of a monumentally hazardous snowfall. We know, we know, you’re too busy daydreaming about a hot summer with a cold breeze to be thinking about what the upcoming blizzard hitting the Mid-Atlantic region means for your pool cover. Read on to learn about offseason pool maintenance and when your pool cover is in the danger zone. Depending on the type of pool you have, if your pool cover was attached properly there’s a small chance that excess snow and water will cause severe damage to your pool itself or the cover. 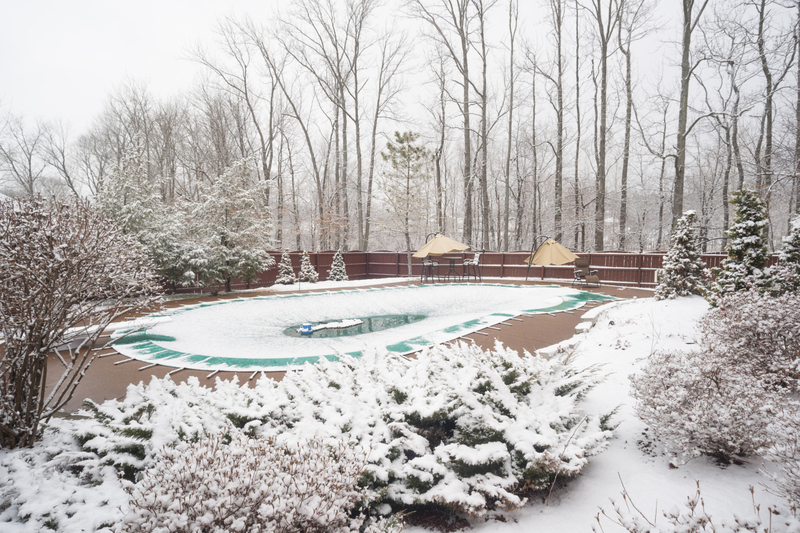 It is usually wise to keep your pool cover clear of debris and excess rain or snow build up, but in this case – it is actually beneficial to leave about six inches of snow on top of your cover. This will help weigh the cover down against strong gusts of wind – during a blizzard, winds can reach up to 35 mph! If you feel it is necessary to redistribute or remove snow from your pool cover, make sure you do so carefully. Never use anything with a sharp edge, as it can result in serious damage. Instead, use a plastic shovel or leaf/snowblower to relieve some of the weight of the snow. 1- 2 Feet: Your pool cover is in the clear – Safe! 2-3 Feet: Remain calm, there is a good chance your pool cover is still safe – but you’ll need to start monitoring the build up. 3-5 Feet: Danger Zone! Immediately clear as much of the snow and debris as possible from your pool cover and distribute the weight of the remaining snow evenly. Winter Blues? Ready to Design Your Inground Swimming Pool! Sunrise Premiere Pool Builders LLC not only conducts Maryland spa, hot tub, and pool installations and renovations but also provides pool services, chemicals, salt generating systems, and more. If you have any questions about your pool contact the professionals at Sunrise Premiere Pool Builders LLC. by calling 410-349-3852 or clicking here today! This entry was posted on Friday, January 22nd, 2016 at 6:16 pm. Both comments and pings are currently closed.